In this study, we examine the relationship between neighborhood-based social capital and residents’ life satisfaction by considering resident heterogeneity. 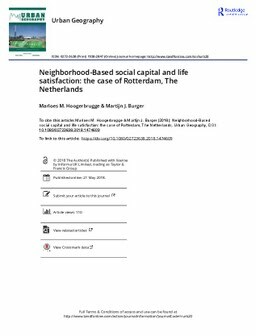 Using a database of the city of Rotterdam, The Netherlands, we find a small but significant positive association between neighborhood-based social capital and individual life satisfaction. However, we also find considerable differences among residents because neighborhood-based social capital is important mainly for people who are more likely to spend considerable time in the neighborhood or who are more neighborhood dependent (i.e. less-educated people, people who live on welfare, people with poor health, retired people, and those who are divorced or widowed). Our results confirm the importance of neighborhood-based social capital for residents’ life satisfaction in terms of both actual social contacts with neighbors and the perceived social cohesion within a neighborhood. At the same time, the importance of neighborhood-based social capital varies among different groups of residents. These findings have important implications for policy-makers.